Bongbong Marcos' Reply on How Much Wealth the Family is Willing to Settle? 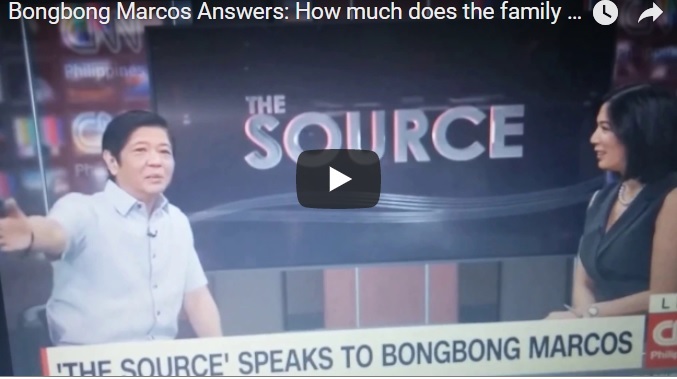 Bongbong Marcos’ Reply on How Much Wealth the Family is Willing to Settle? The late President Ferdinand Marcos was a wise man. His promise to take care of his people after death is possible if the sectors involved will cooperate with his heirs. His son, Bongbong Marcos does not even know how much their family’s wealth is worth. It’s just something that they have to settle. There’s a legal process to follow. However, DOJ Secretary, Vitaliano Aguirre said; “We did not receive any instructions from higher-ups yet. We are completely ignorant about it,” he explained. [VIDEO]: Bongbong Marcos explains why ex-PCGG Chairman Bautista knows better about the sequestered Marcos wealth. Bongbong Marcos bluntly answers that he does not know exactly how much wealth his father had kept. He recalls that when they were exiled in Hawaii, they only had the clothes in their bag. All documents and possessions were ceased by the American government. PCGG ex-chairman Andres Bautista knows better with regards to their personal treasures at that time. On the alleged golden wealth, the former Senator said that the government can have what they can find. It is known in many pieces of evidence that the Marcos Foundation holds the rights to the gold certificates. Its beneficiaries are the Filipino people. It is recorded in the Central Bank. The government has the jurisdiction for its assignment in cooperation with the World Bank. Its claim from various overseas banks needs the bill of lading kept by the heir of the late President Marcos which is his wife. The World Bank is the globe’s martial for their intended use as willed by Marcos. The Senate must listen to Congresswoman Imelda Marcos and hear the sides of the trustees. Bongbong Marcos frankly said in another interview that there are strong groups that are working to destabilize the Du30 administration. The president has a close alliance with the Marcos family. Suspicious remittances, Marawi rebellion and, mind-conditioning surveys manifest all at the same time. The opposition continues to attack him using such black propaganda. This can go intense as the recount for the VP post is about to begin in February 2018. The destabilization efforts tend to block the administration’s cooperation with the Marcoses. Compromise deal on Marcos wealth pushed to Palace back burner?